FitDeck is a unique deck of Exercise Playing Cards that makes exercise more simple, convenient, and fun. FitDecks are available in 56-card and 26-card Booster decks. 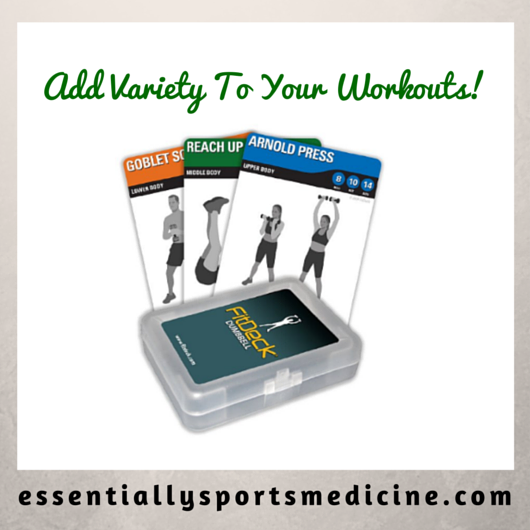 56-card FitDecks specialize in bodyweight-only exercises. 26-card Boosters may require certain equipment (i.e. Exercise Ball, Pull Up bar, Dumbbell, Balance Dome, Kettlebell, etc.). Boosters can be used as a standalone workout or they can be combined with other FitDecks to create an even more challenging routine. Each card has three fitness levels to accommodate different abilities (beginner, intermediate, advanced). Cards are held in a plastic cardholder making it easy to carry and draw cards while on the go. Here are the FitDeck collections that you can find on Amazon (most of them are Amazon Prime eligible! ): Bodyweight (Video), Cones (Video), Core Blast (Video), Dumbbell (Video), Exercise Ball (Video), FitDeck Junior (Video), Medicine Ball (Video), Navy Seal (Video), Office exercises (Video), Pilates (Video), Plyometrics (Video), Resistance Tube (Video), Speed, Agility & Quickness (Video), Stretch (Video), TRX Suspension Trainer (Video), Vertical Jump exercises (Video) and Yoga (Video). 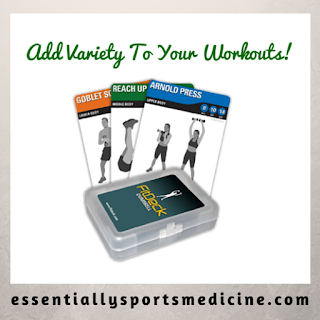 Click here to see all of these FitDeck collections on Essentially Sports Medicine's Amazon Store. Athletes, coaches, fitness enthusiasts, healthcare professionals and teachers, add more fun and variety to your workouts today!